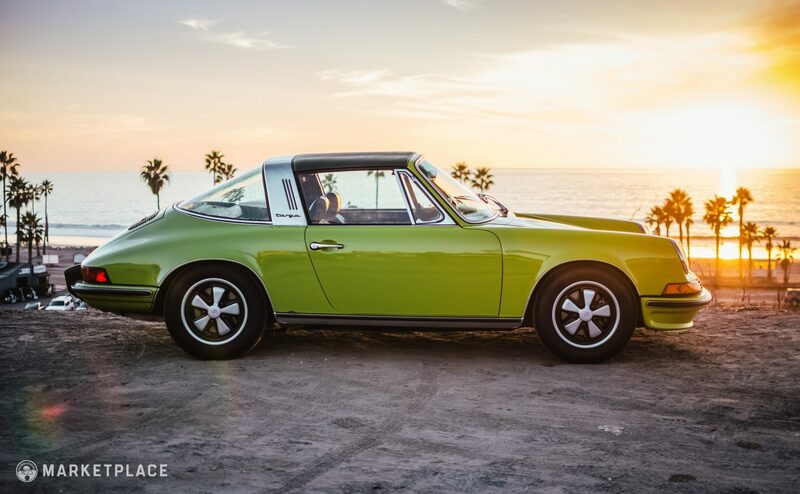 Since the 911’s inception, Porsche had long been considering a convertible version of their sports car. 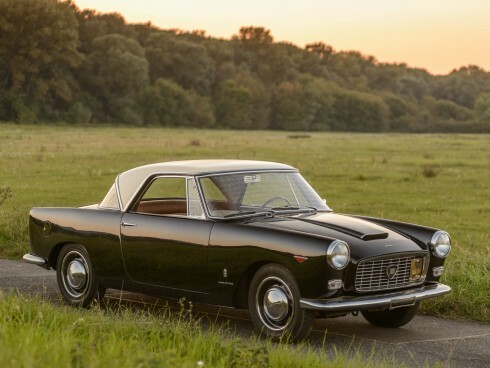 However, development complications coupled with the National Highway Transportation Safety Administration’s evolving rollover requirements meant a conventional drop-top wouldn’t cut it. 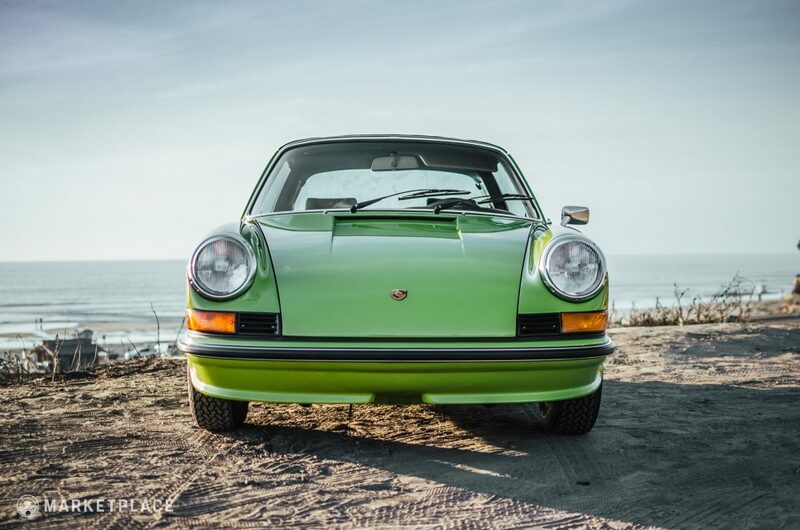 The American market was strong, and Porsche couldn’t risk failing to meet the United States’ stringent rules. 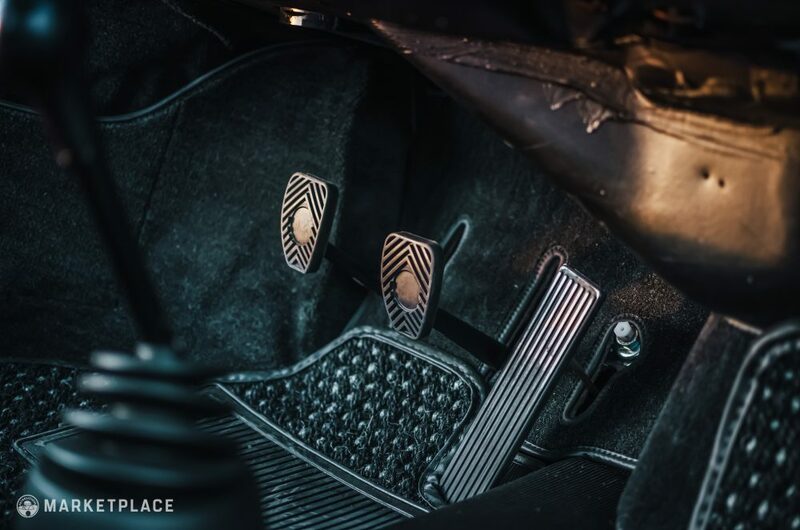 The team in Stuttgart needed to come up with something clever. 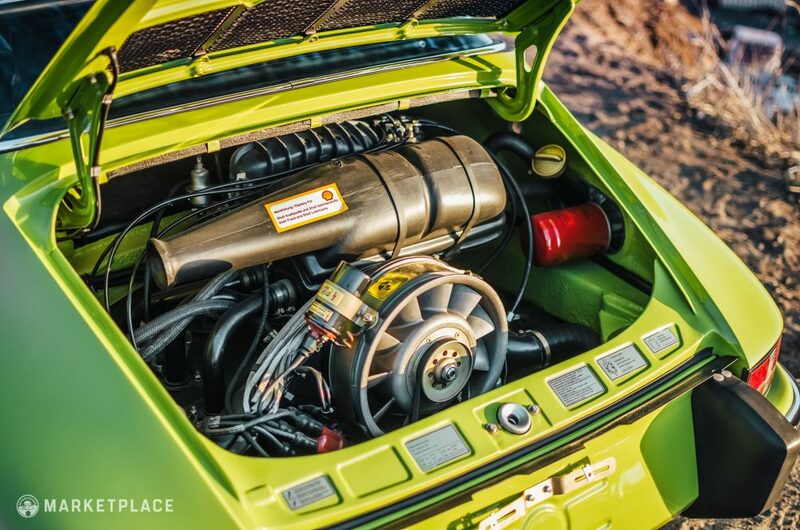 Thankfully, the Germans don’t disappoint when it comes to creative engineering. 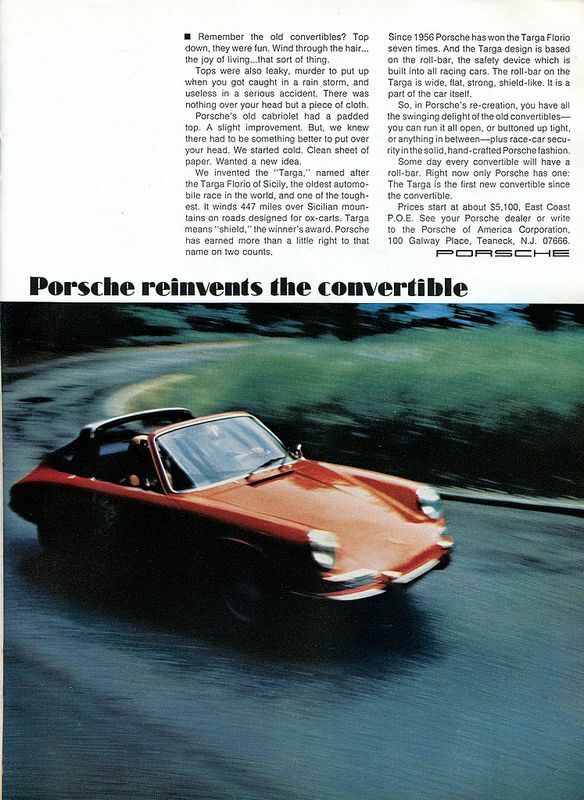 In 1967, Porsche unveiled a new model: the Targa. 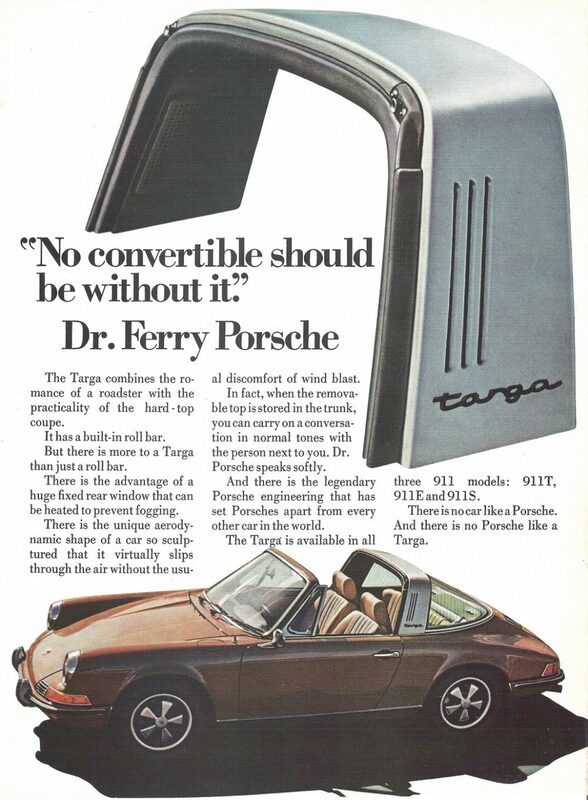 Named after their successful stints in the Targa Florio, the Targa had a unique rollover hoop, a handsome piece clad in contrasting aluminum (unless you ordered a silver one of course). 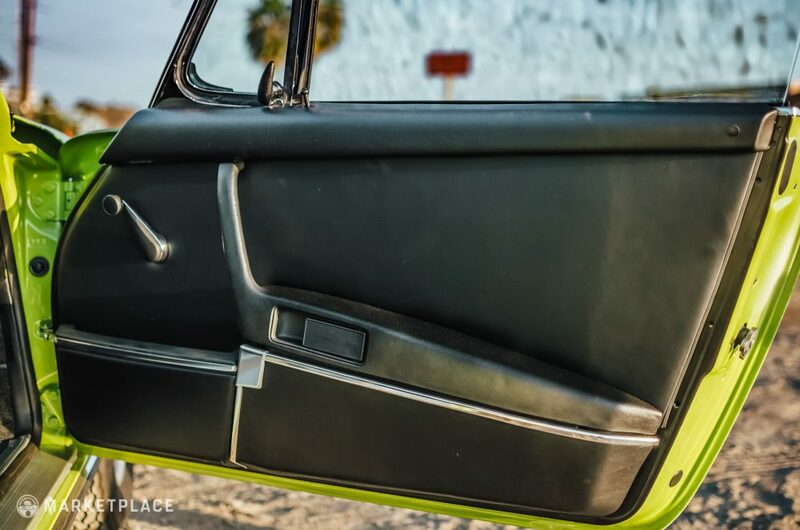 Behind the hoop was a button-fastened clear plastic window, which could be removed along with the center section pop-out vinyl roof section over the main cabin. 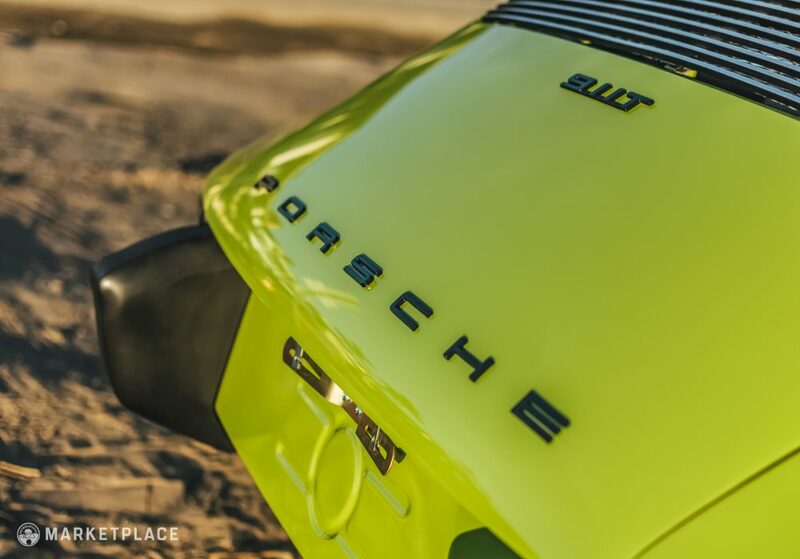 The result was a fresh and original take on the convertible concept. 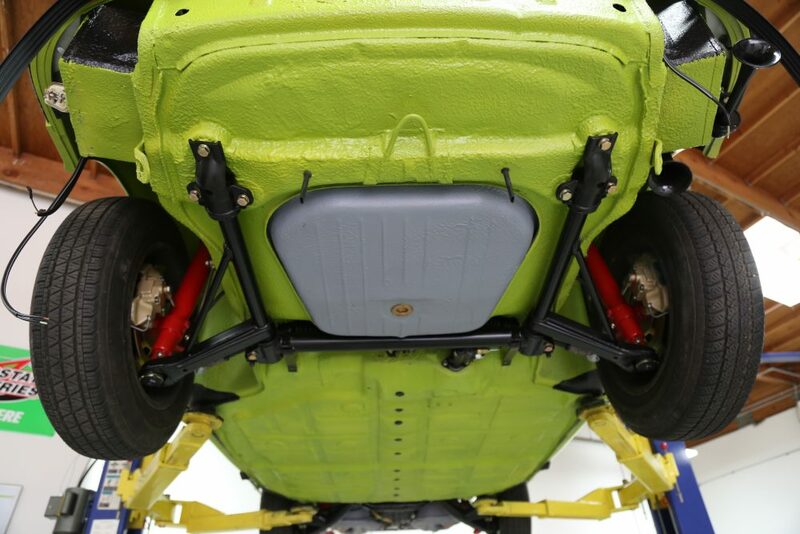 Best of all, it met U.S. market safety requirements without being an eyesore. 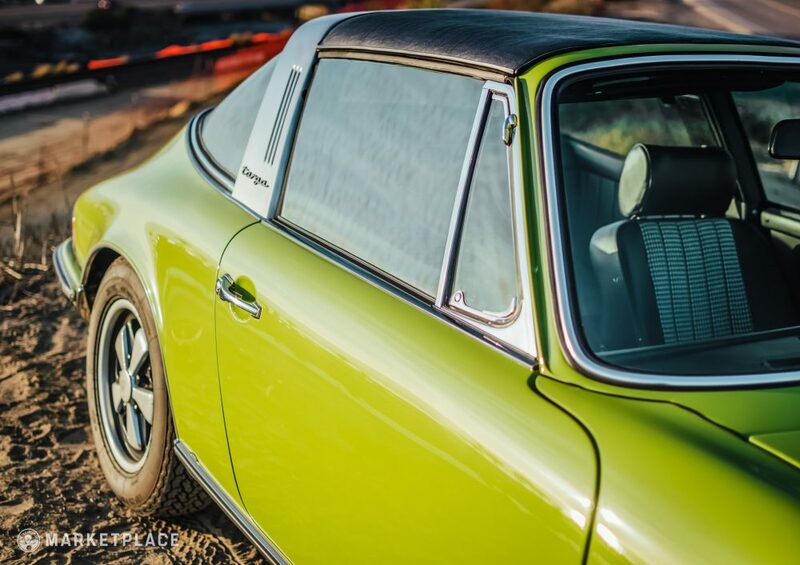 In 1968, the rear plastic window was replaced with a large wrap-around piece of glass, and the roll bar section received three small slits on each side for a slight styling update. 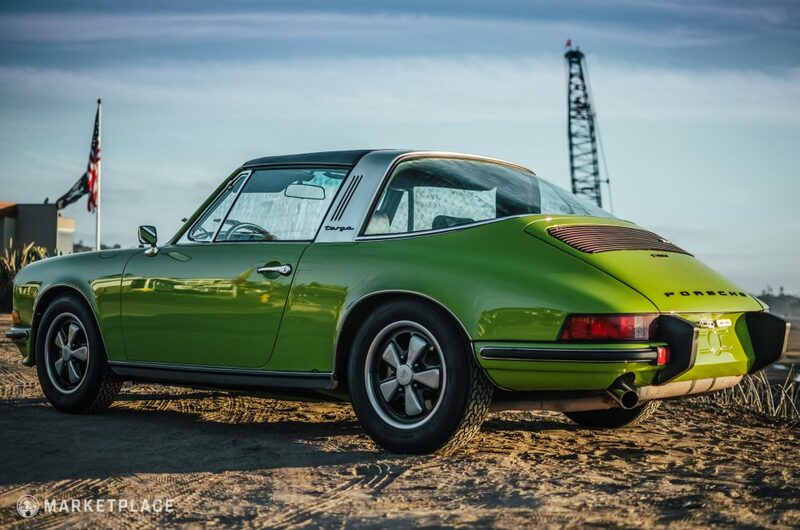 Although Porsche would add a genuine cabriolet to the 911 lineup later on, the Targa remains a unique design, and a staple in the 911’s lineage; if anyone can make the best of challenging regulations, it’s Porsche. 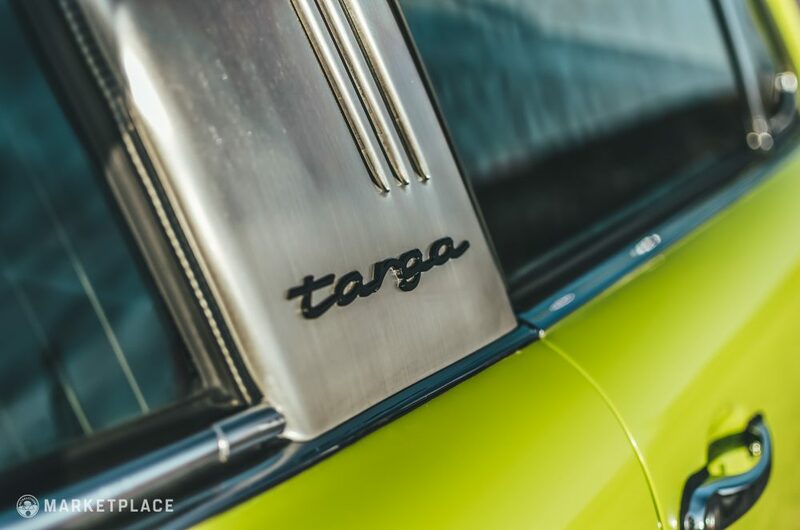 For many, the coveted Targas are the post-‘68, pre-’74 cars, i.e., longhoods with glass rear window. 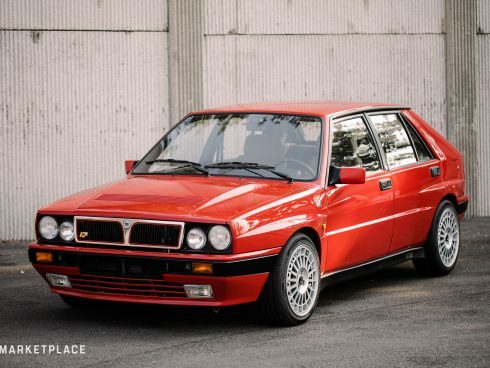 It’s simply the best looking to bear the badge. 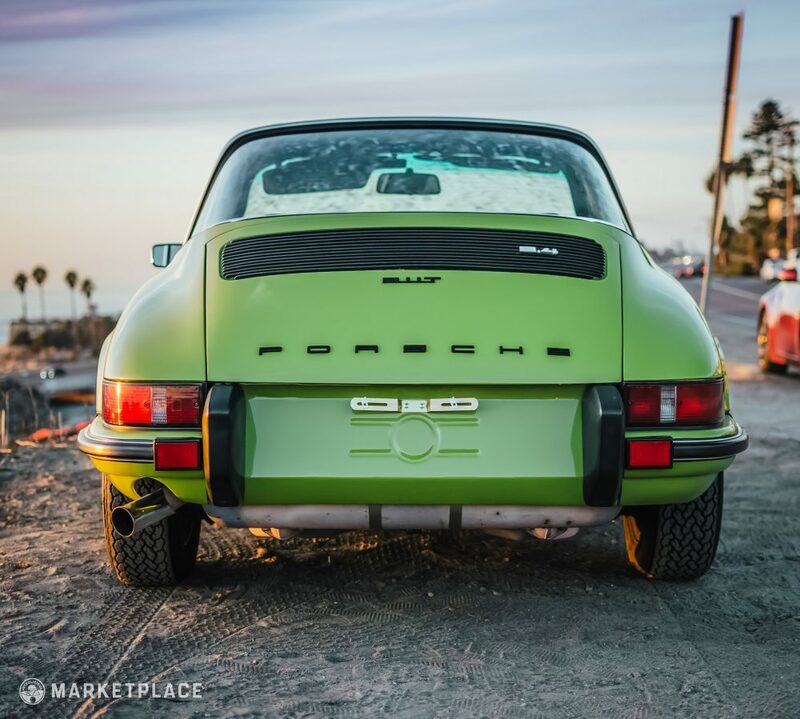 The clean front end with the body-integrated bumpers set into the narrow body with a wingless deck lid is uncluttered and beautiful without being boisterous about it, and the thin trim makse the large rear glass stand out even more. 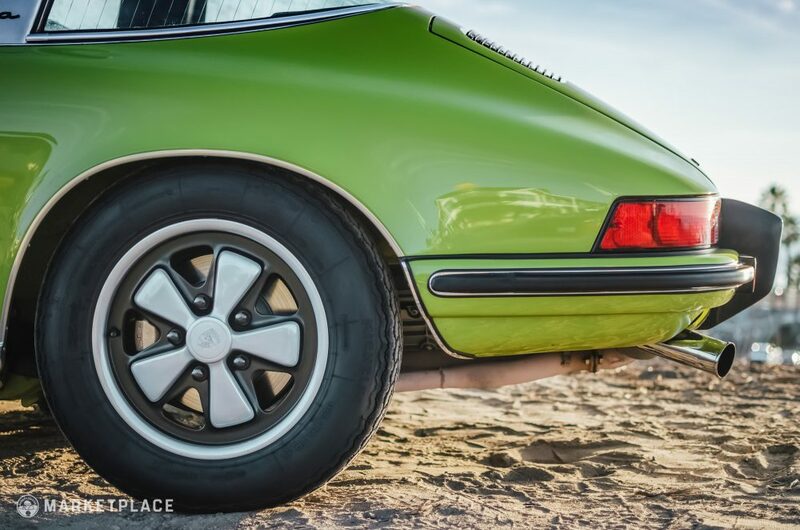 The Fuchs complement the brightwork and brushed aluminum center hoop nicely. 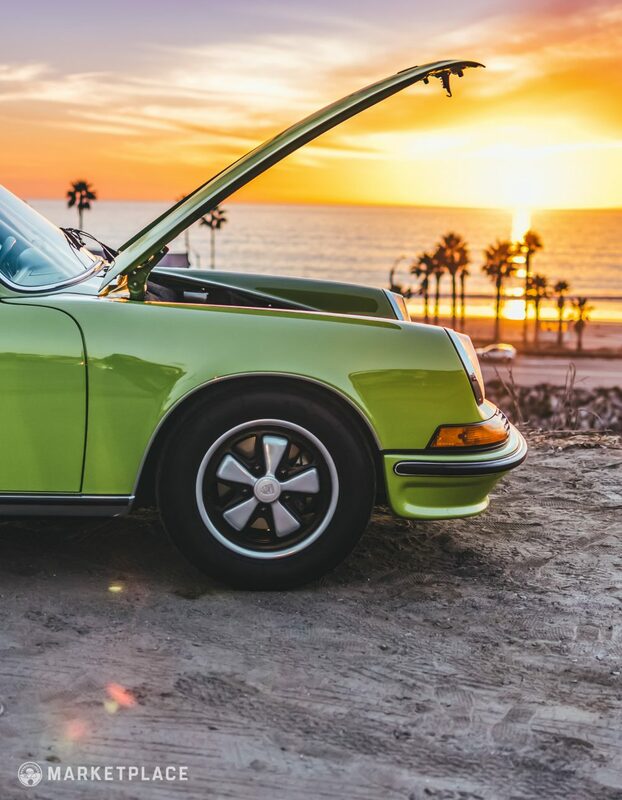 It’s a classic 911 aesthetic that looks at home in the autumn Midwest as it does in the sunny beach towns of California. 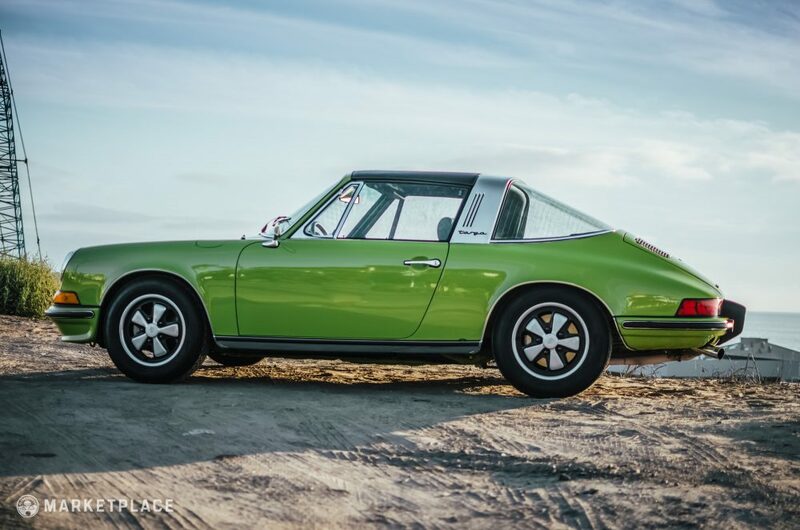 This 1973 Porsche 911T Targa is a midyear model that features the Bosch K-Jetronic Continuous Injection System (CIS). 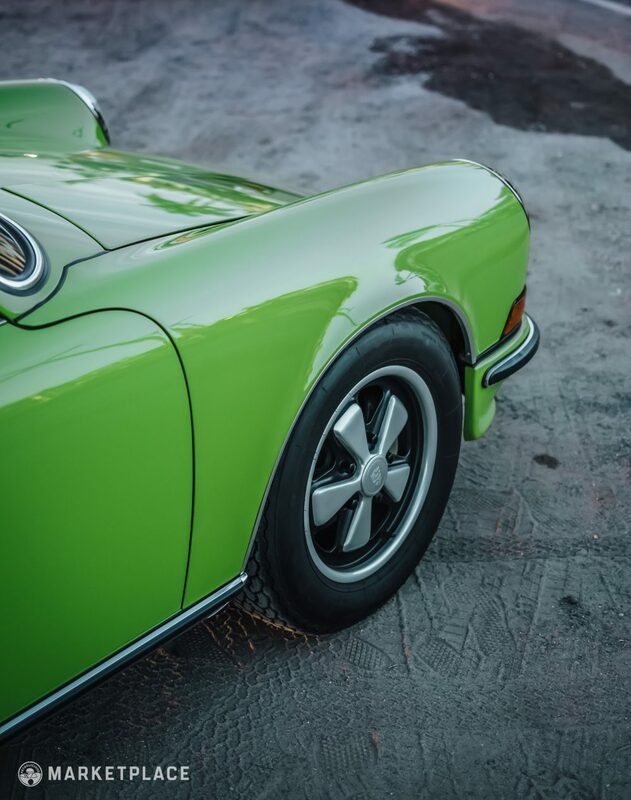 This numbers-matching Targa has benefited from a ground-up, nut-and-bolt restoration performed by Makellos Classics of Escondido, California. 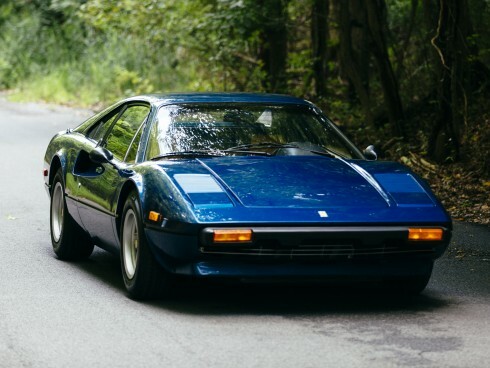 The restoration (full photos included at the end of the listing) included a complete dismantling of all glass and panels, as well as disassembly of the full interior and powertrain. 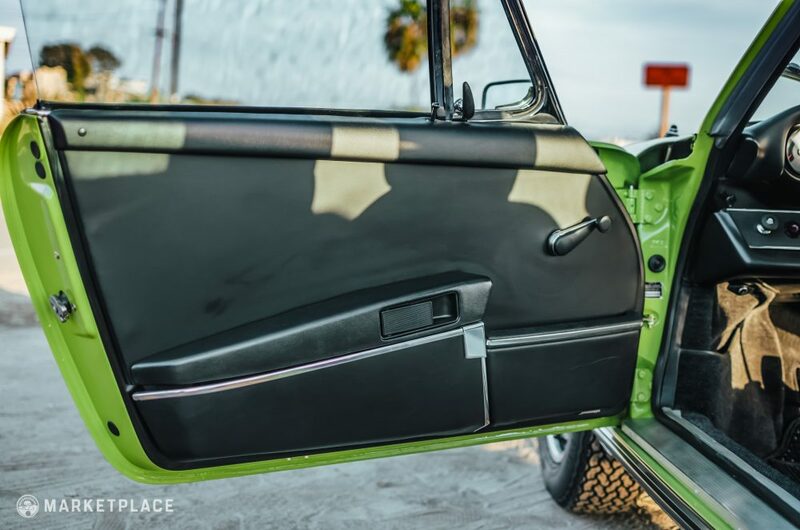 Rust was minimal, and the only panels requiring replacement were the doors. 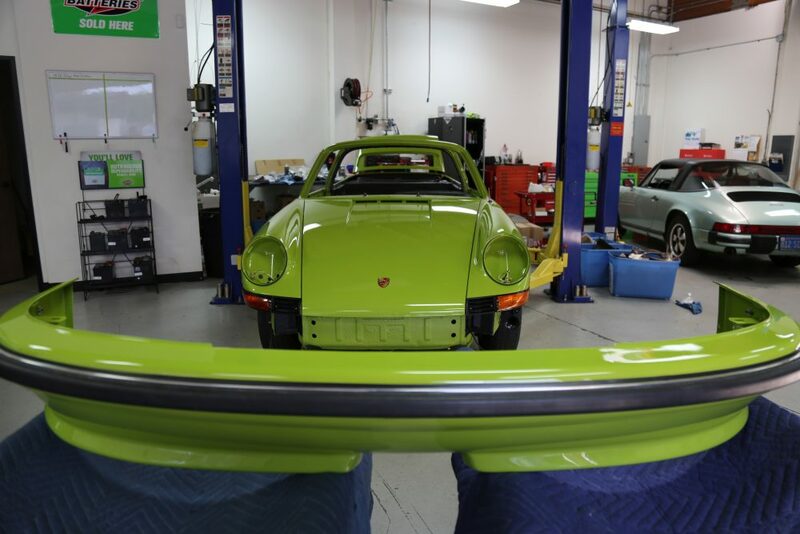 The replacements are authentic Porsche pieces, and all panels were fitted for correct gaps prior to paint. 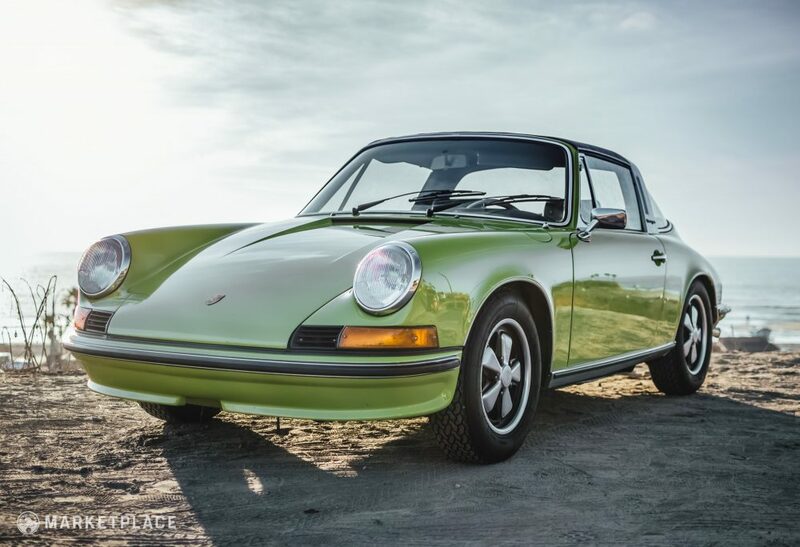 The car was professionally repainted in its original nonmetallic Chartreuse Green, which Porschephiles will recognize as an extremely rare factory color. 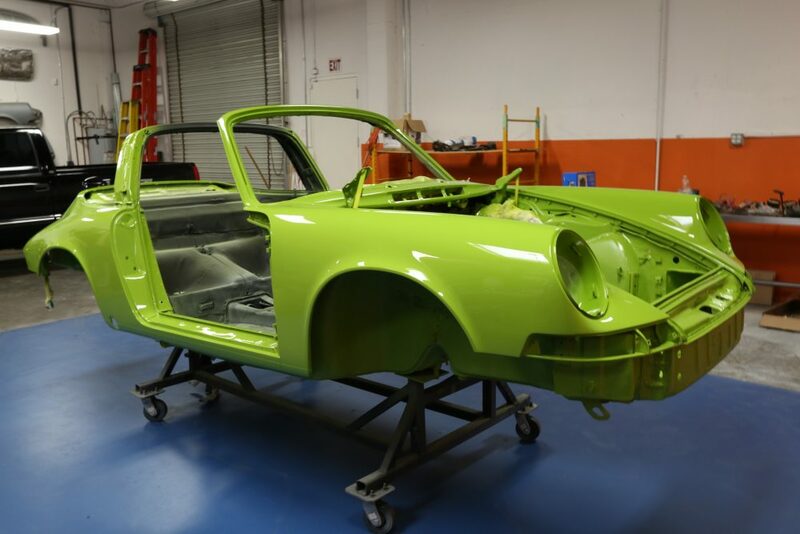 All lighting equipment, trim, and brightwork is original to the car unless the pieces were too damaged to reuse, in which case genuine Porsche replacements were sourced and installed. 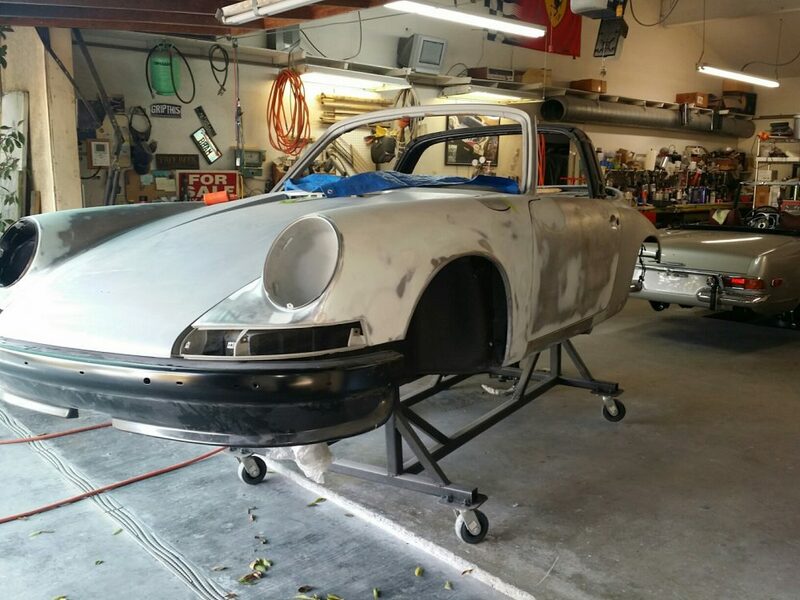 All rubbers seals, gaskets, and squeegees were replaced in addition to a new Targa roof panel vinyl by Escondido Custom Upholstery. 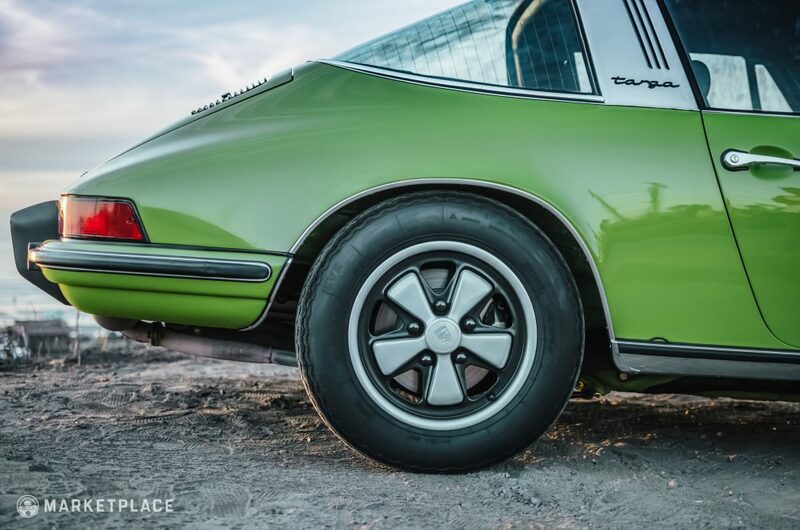 The Fuchs wheels have been restored to their factory look by a process of hard anodizing and repainting. 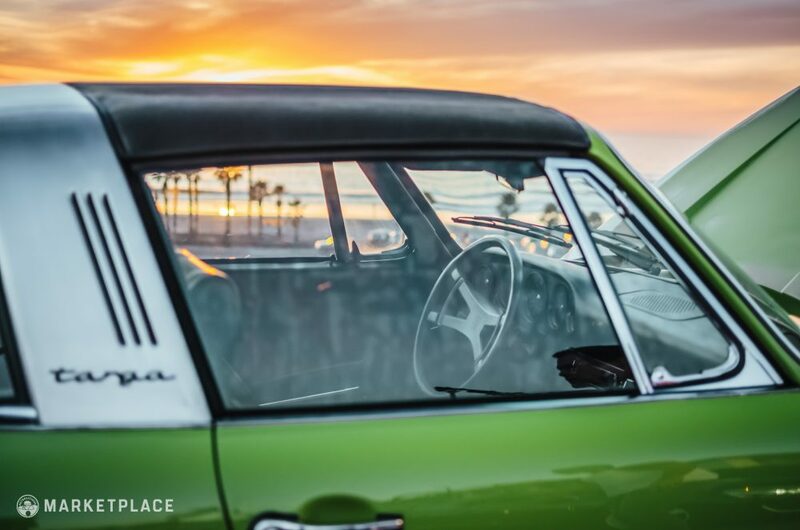 The greenhouse is comprised of the correct and original glass, which remains in excellent condition with no cracks or scratches to note. 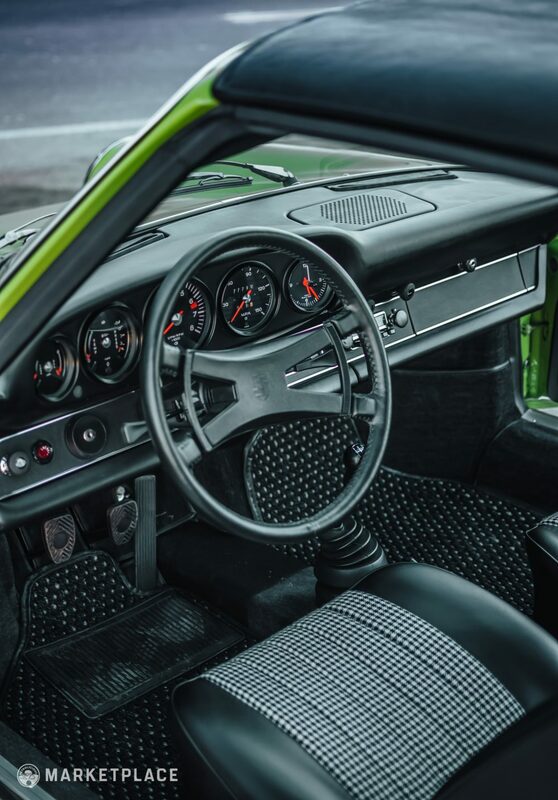 The interior was reupholstered from the carpets to the door panels, the dashboard to the seat covers, and is complete with all factory switchgear and accessories, all of which function properly. 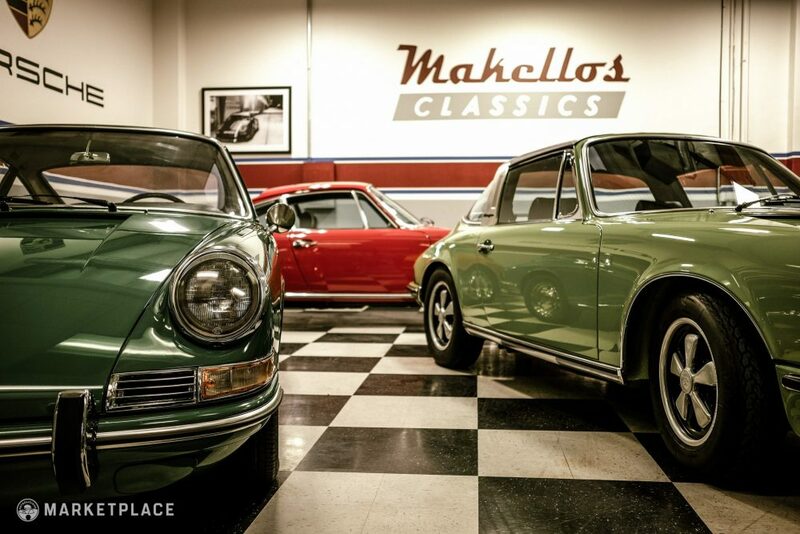 The engine and transmission are numbers-matching units original to the car, and were rebuilt to factory specifications in-house by Makellos Classics’ certified Porsche technicians. 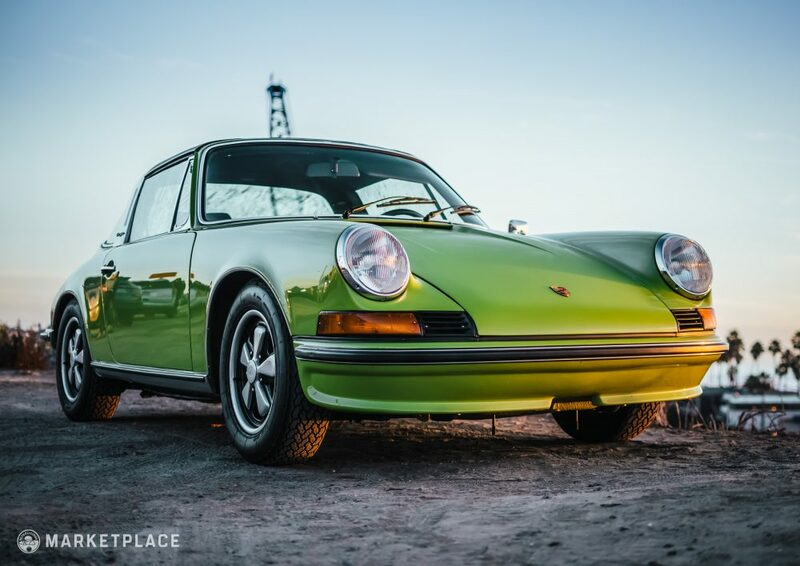 The car starts, idles, and drives as if it just rolled off the assembly line, offering plenty of power with the build quality and solid German reliability Porsche is known for. 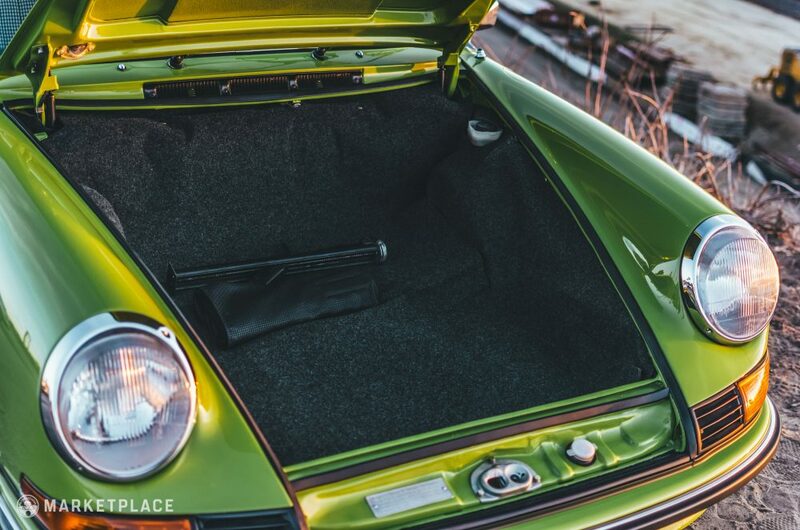 Body – The body is accident and corrosion free, and it is original with the exception of Porsche-sourced replacement doors and seat pans. 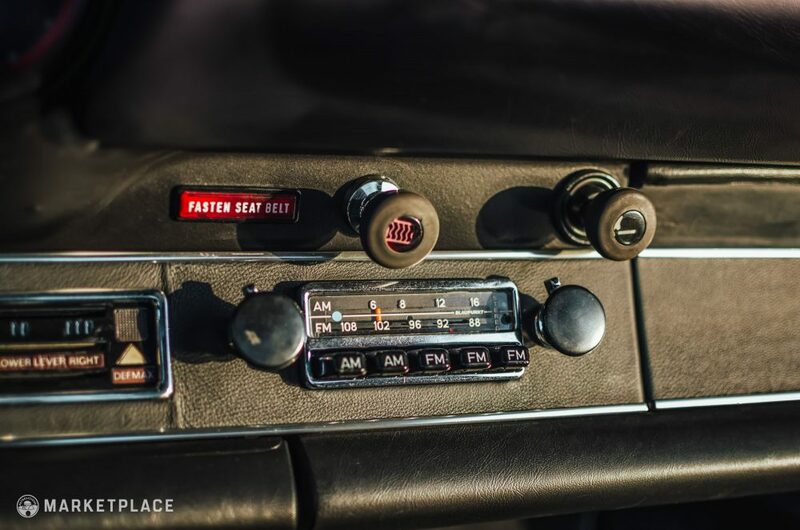 Panel fitment is excellent throughout. 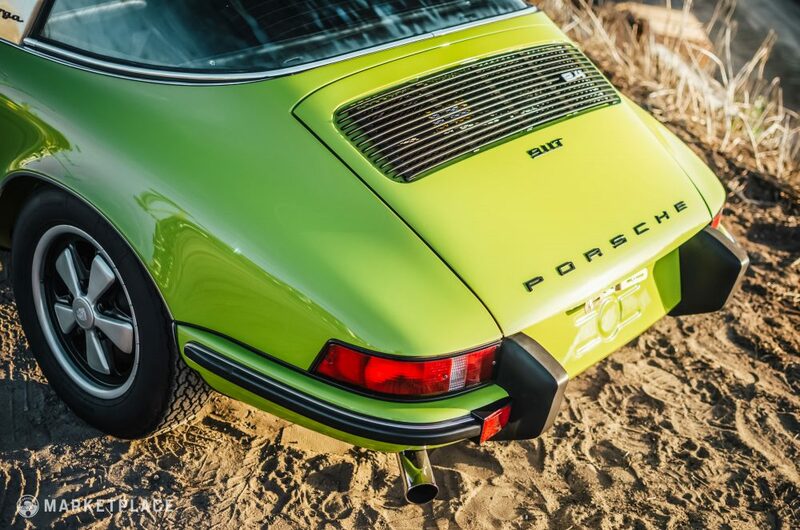 Paint – Repainted in early 2017, the Chartreuse Green respray is of the highest quality, with exceptional shine and no imperfections. 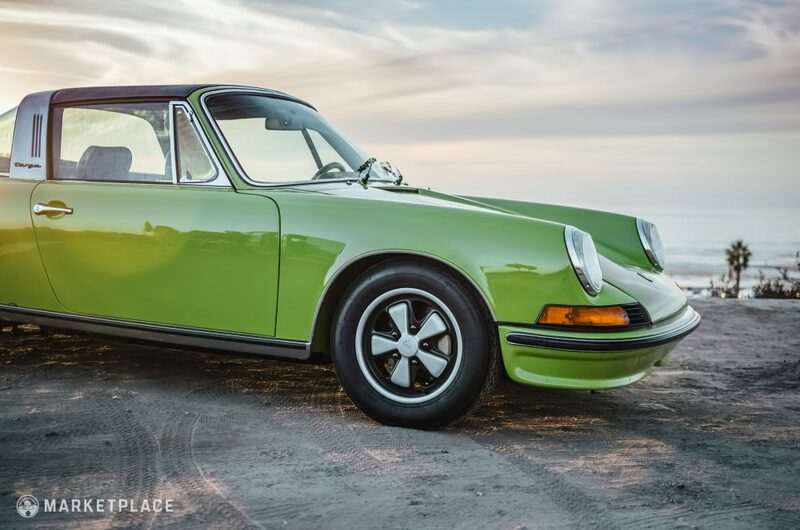 The color is quite unique as well, always changing hue in varying light and shadows which will surely put a smile on your face. Trim & Glass – All brightwork has been cleaned and polished or replaced with factory-correct pieces where required. 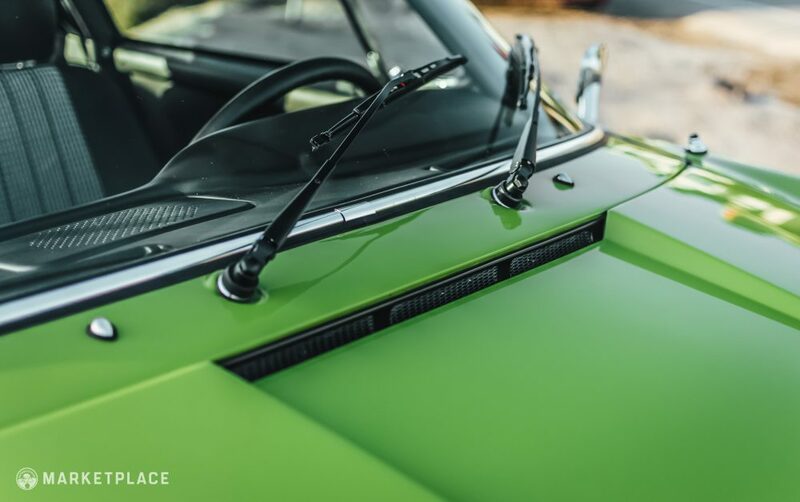 The original glass is clean and free of any nicks, cracks, or scratches. 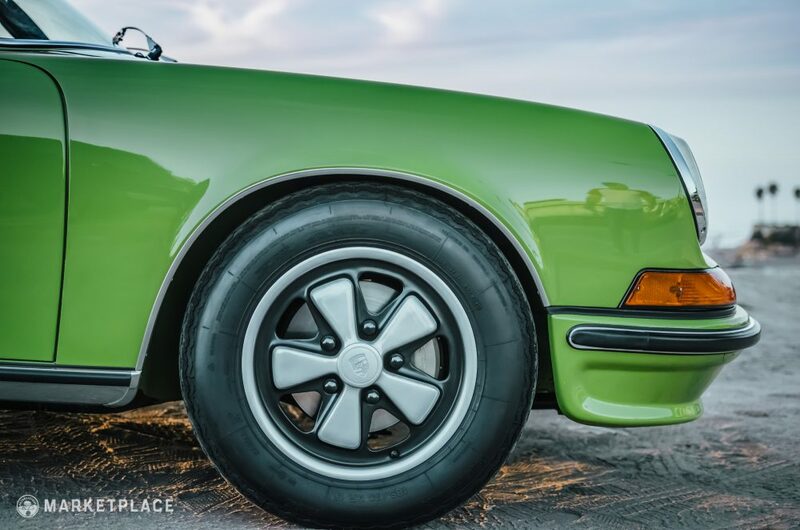 Wheels – The 15-inch Fuchs wheels were hard anodized and then repainted to their correct OEM style. 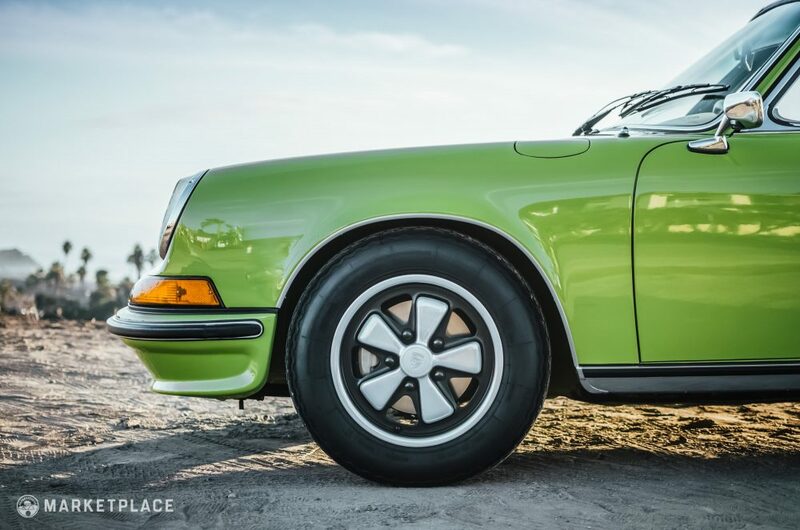 185/70 section retro-styled new Michelin tires are on all four corners, and provide reassuring modern grip while maintaining a period-correct look. 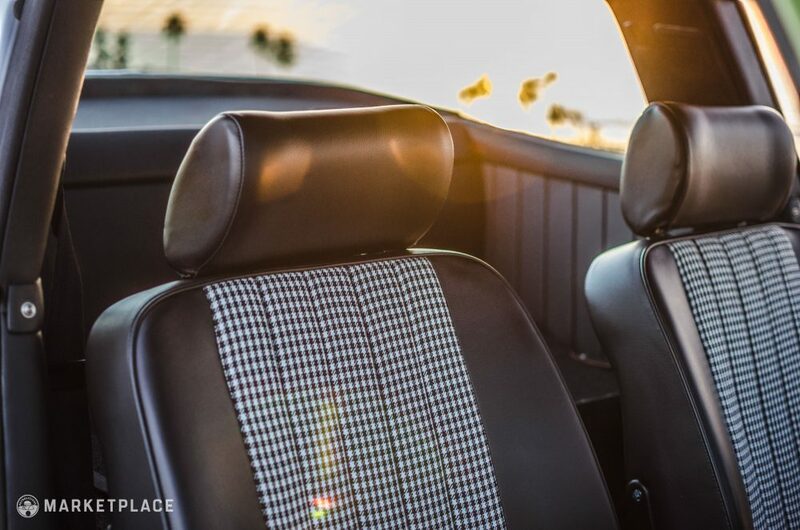 Targa Top – Escondido Custom Upholstery was hired to rewrap the original Targa top frame in the factory-style vinyl. 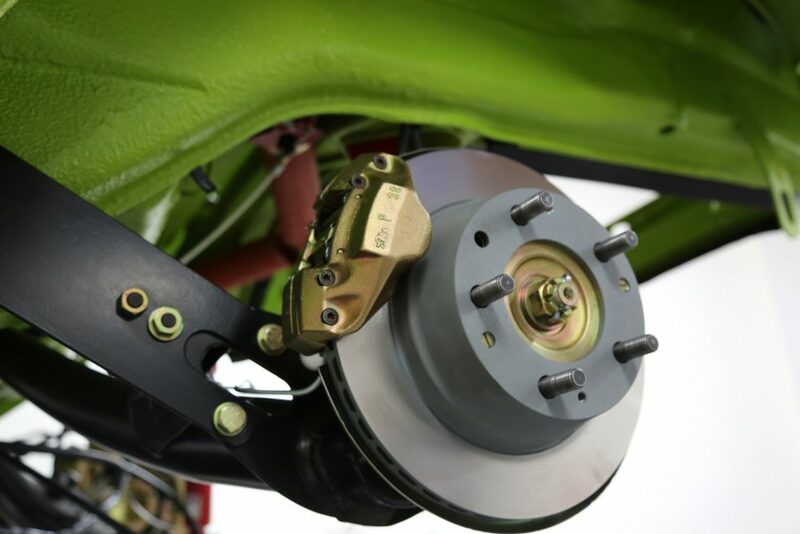 Fitment is spot on and ensures a watertight seal. 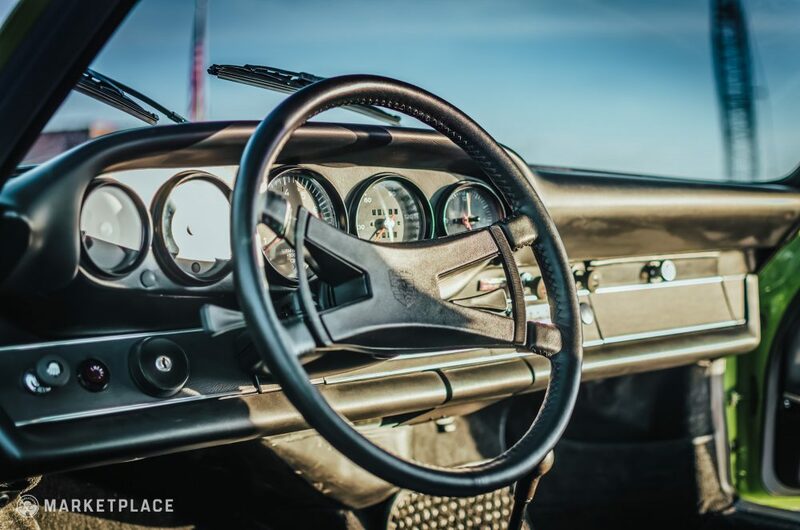 Steering Wheel – The original four-spoke steering wheel received a new leather wrap and appears like-new. 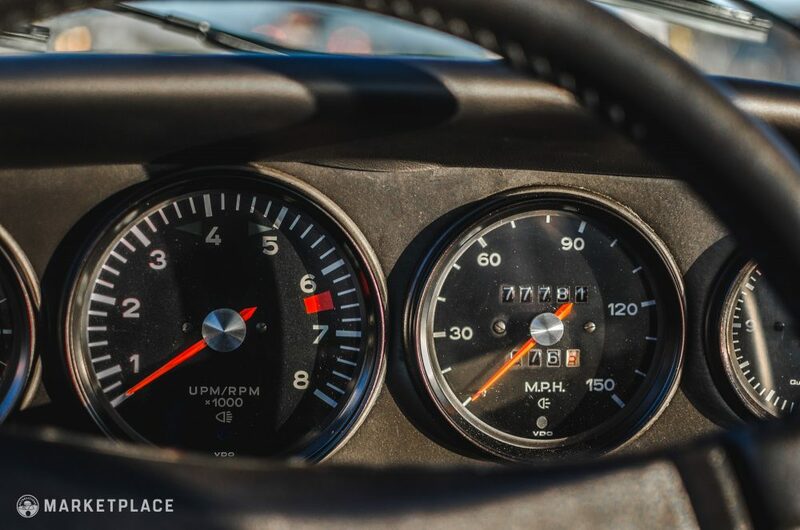 Dashboard & Instrumentation – The dash pad was replaced with a new genuine Porsche unit and the original VDO dials are clean, clear, and fully functional. 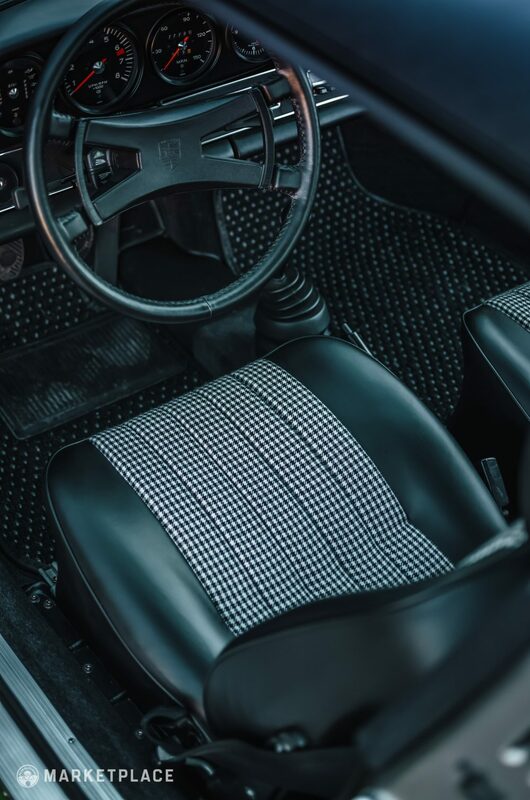 Seats, Trim & Carpet – The seats were rewrapped in new black leather covers with new but era-correct black and white houndstooth centers. 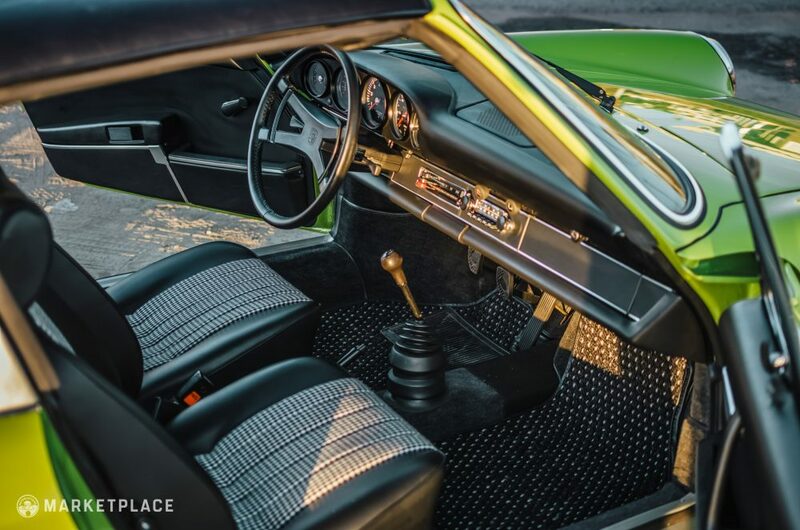 The carpeting and door panels were also replaced with the correct materials. 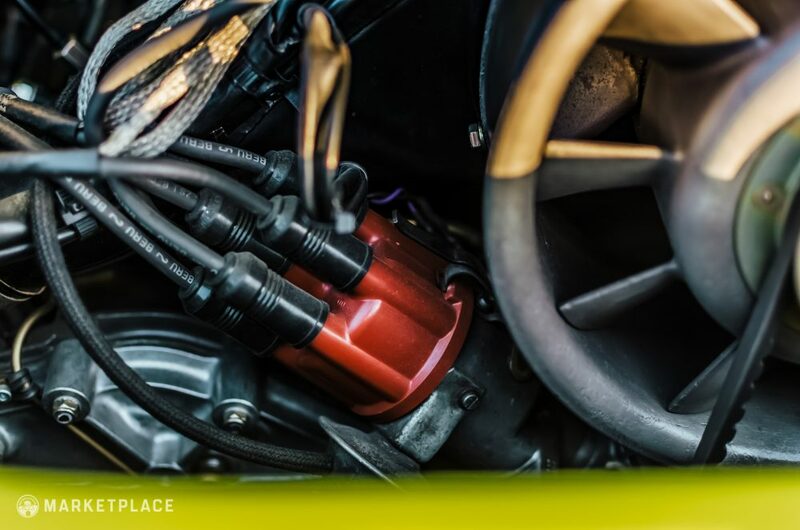 All switchgear and accessories are clean, complete, and in good working order. 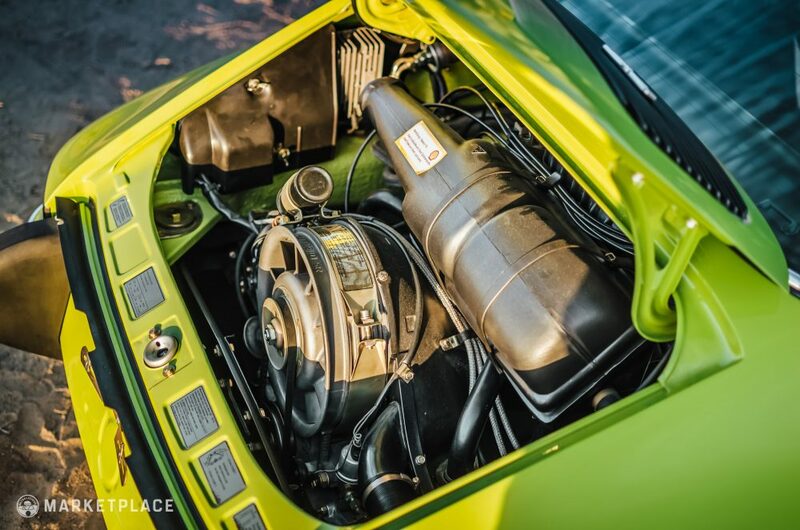 Engine – The 2.4-liter CIS flat-six was completely dismantled and rebuilt to factory specifications by Makellos Classics’ certified Porsche technicians. 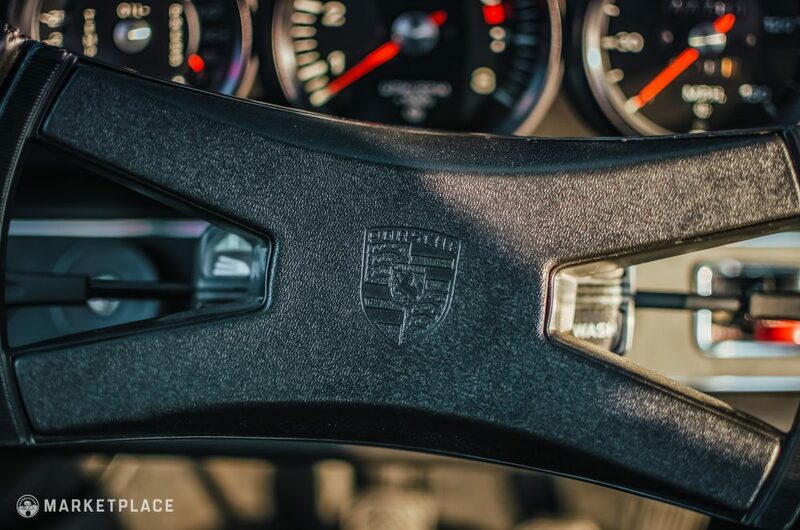 The Drive: The engine fires from cold starts eagerly, the idle is rock steady, and it revs in that perfect hollow metallic tone only a Porsche flat-six can deliver. 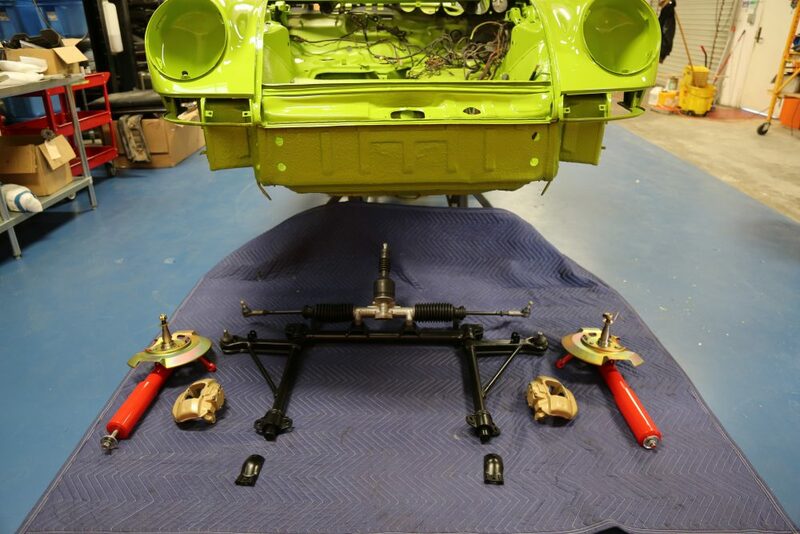 Transmission – The 915 five-speed manual transmission was also completely dismantled to have its internals inspected. 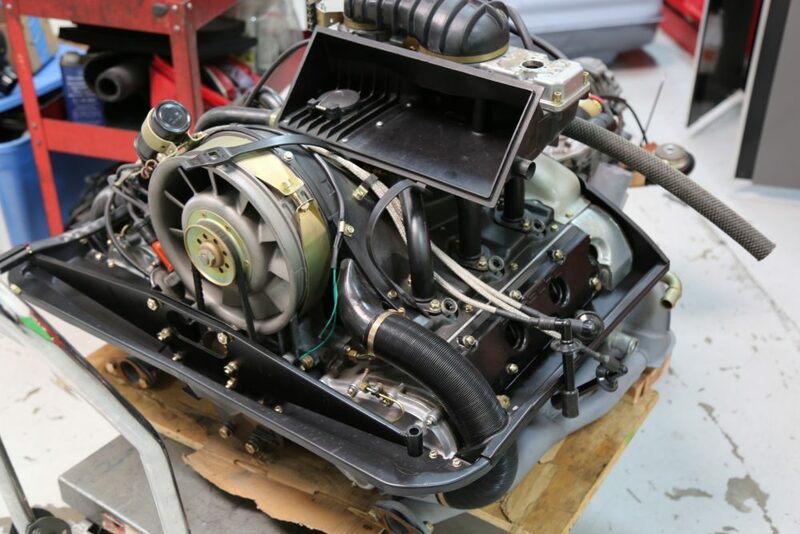 All synchros were replaced and the transmission was rebuilt. 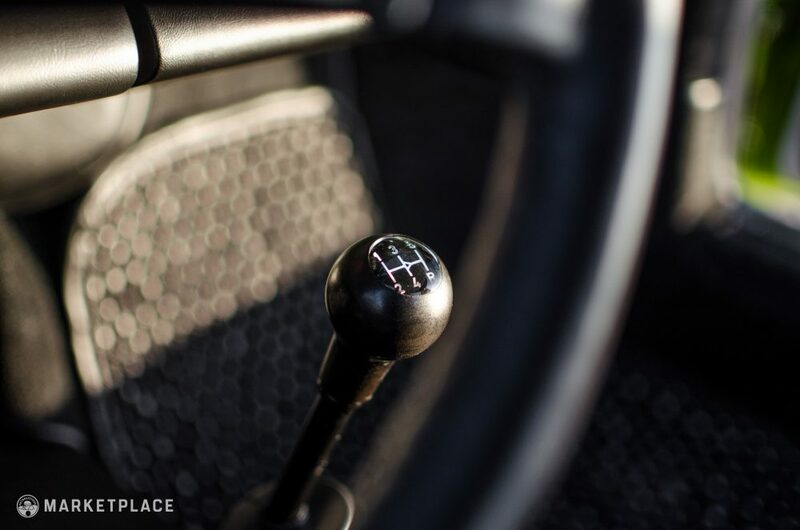 The Drive: The five-speed shifts easily, gliding between gears smoothly during changes with no gear engagement resistance or pop-out issues. 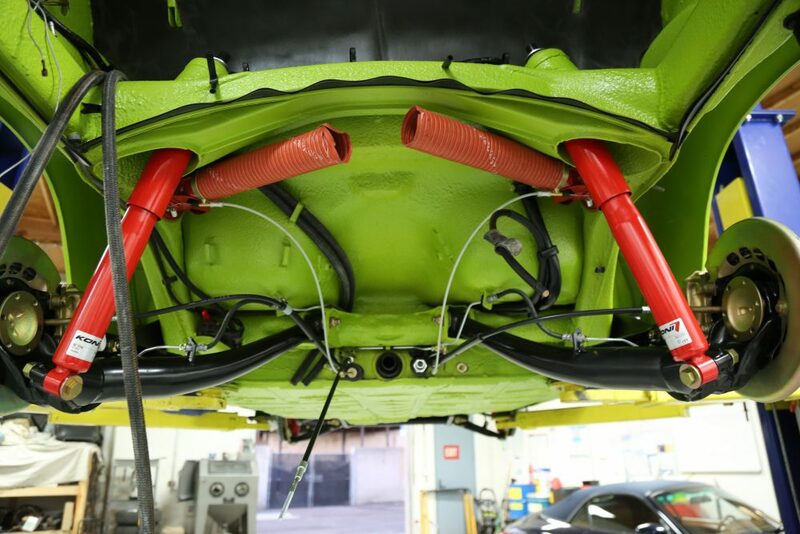 Handling – All drivetrain components were replaced with factory-spec replacement components to revitalize the original handling characteristics these early lightweight longhood cars are renowned for. 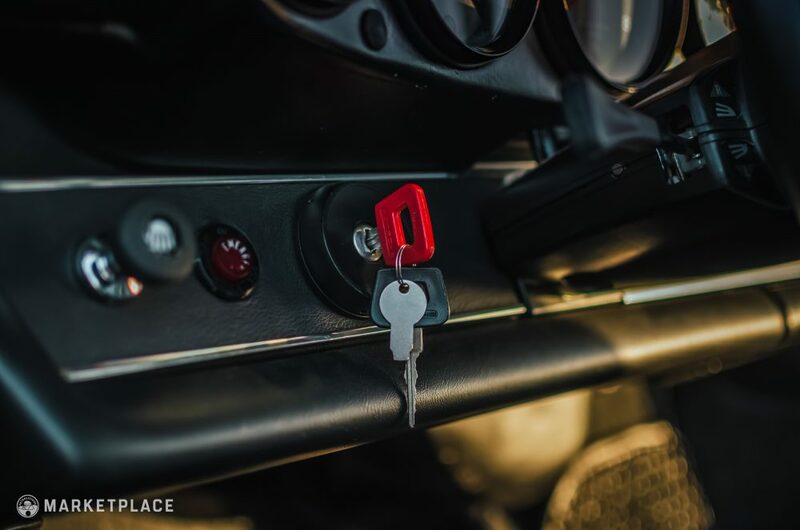 The Drive: The car is a real gem to drive, with excellent feedback from all controls, a smooth singing flat-six, buttery five-speed manual, and light but direct steering feel. 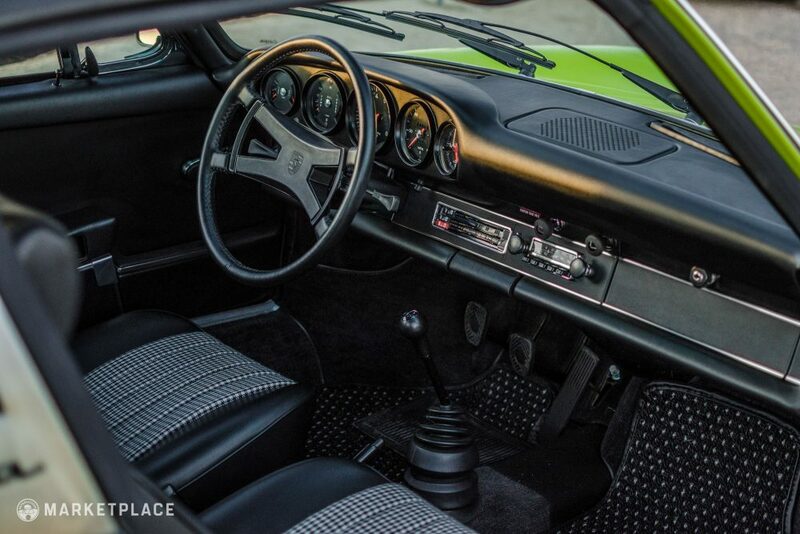 Aside from the door panels and seat pans, the body of this 911T is entirely original. 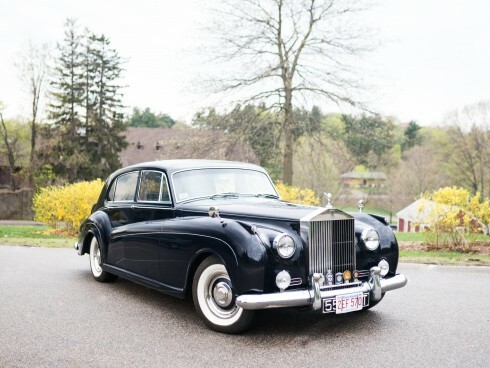 The restoration was executed with great care to ensure a correct fit and finish throughout. 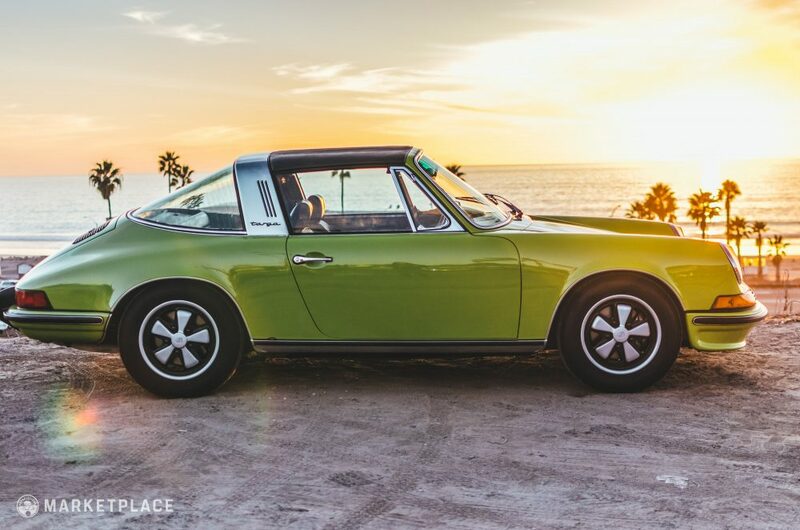 Restored to its original build sheet specifications, this 1973 Porsche 911T Targa sports a rare color combination that is actually correct to the car, and it makes this a total ’70s period piece. 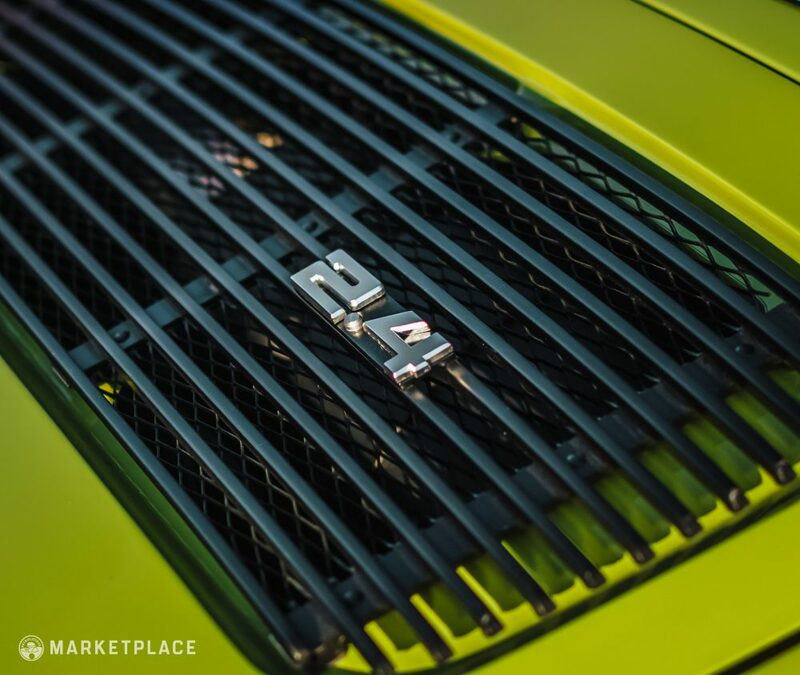 The Chartreuse Green color really pops in the sun and compliments the Targa design and houndstooth interior beautifully. 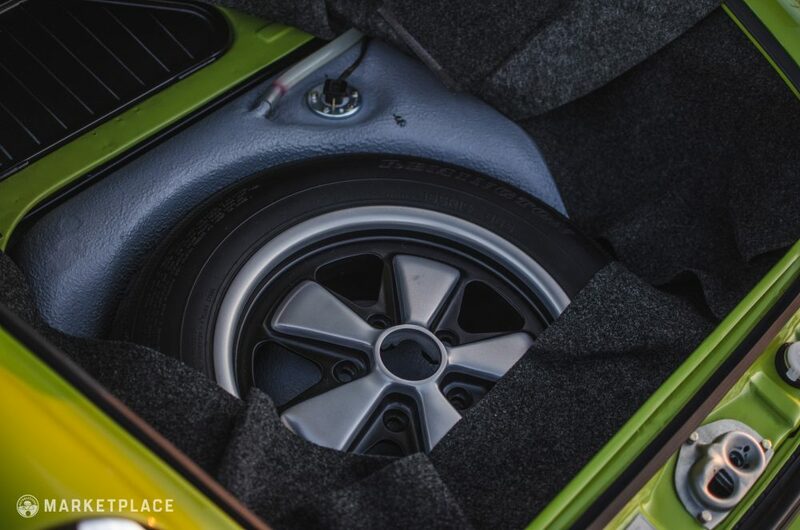 Accompanying the sale is a correct, but not original to the car, spare wheel, jack, toolkit. 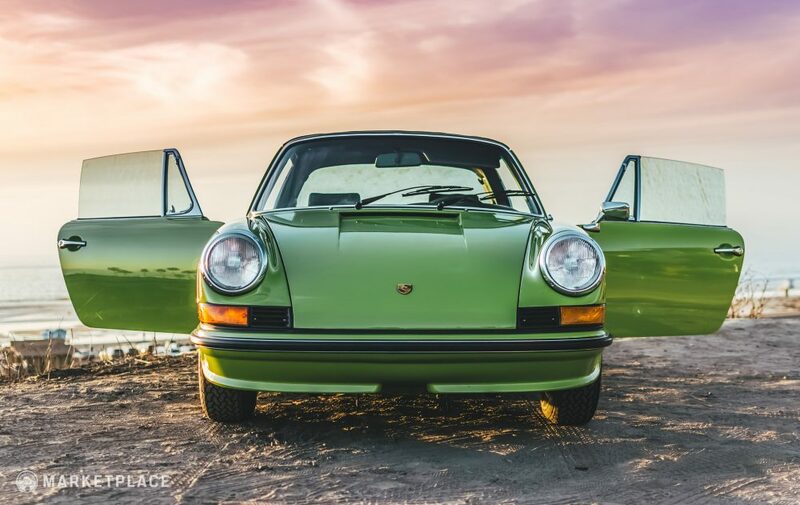 The original owner’s manual is included along with extensive restoration receipts thoroughly documenting the entire rebuild process. 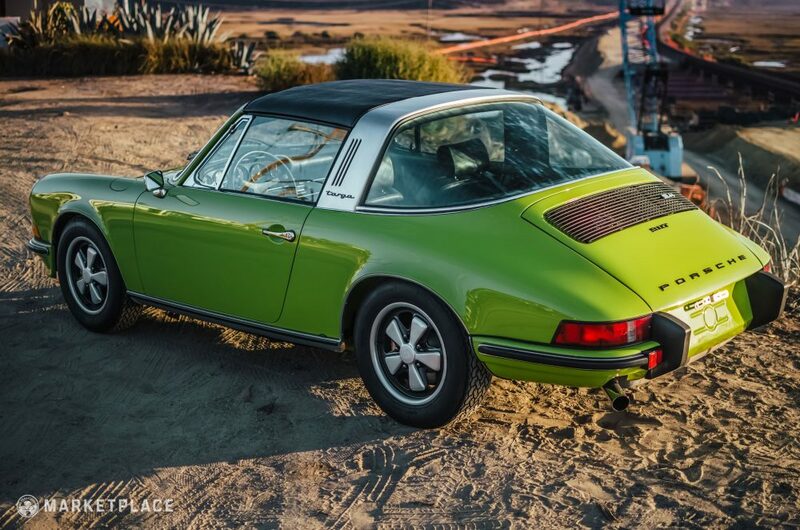 Quintessential Targa – While the original ’67 had a plastic rear window and newer Targas are more novel in their engineering, the longhood glass-back Targa is still the one to get. 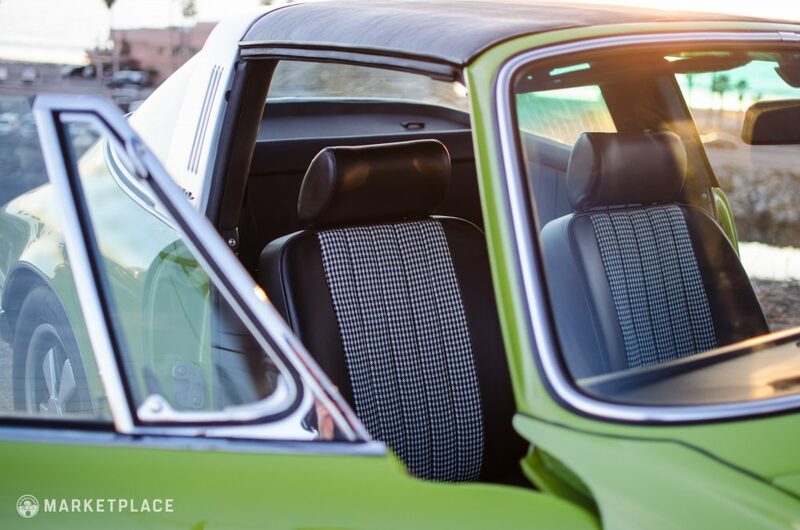 Finished in a vibrant green over classic black and white houndstooth, does it get any more 1973 than this? 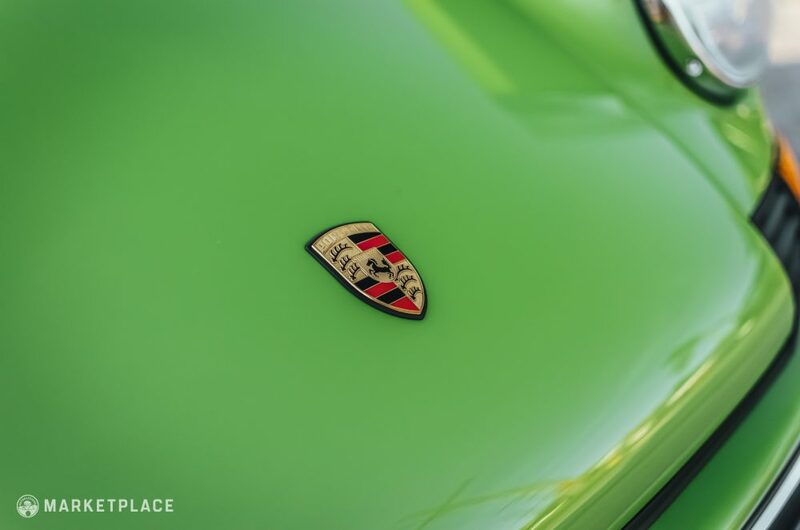 Color – This is simply one of the most unique car colors of all time. Light and shadows constantly change it’s hue which will always give you something special to look at. 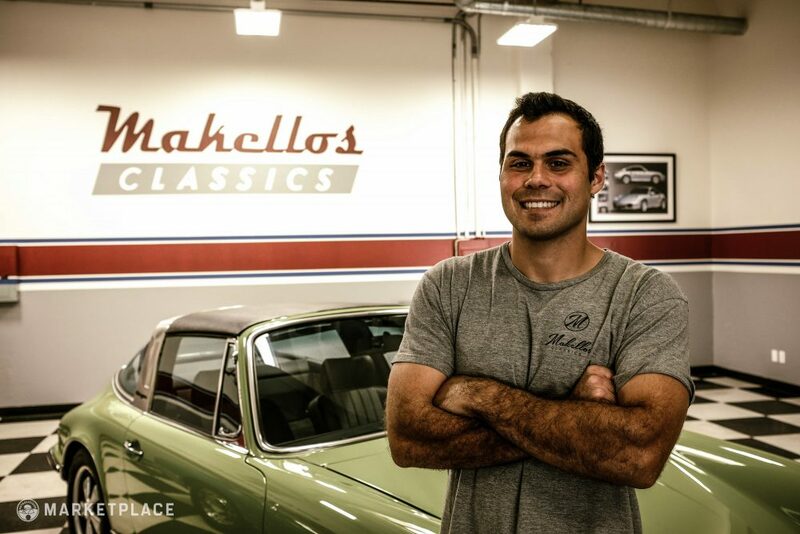 This car is for sale by Matt Kenyon of Makellos Classics. You can get to know him better here.